In conjunction with the holy month of Ramadan this coming May 2017, The Puteri Pacific Johor Bahru and Persada Johor International Convention Centre offering the Ramadan Buffet for this year. Delectable choices of cuisines and a lavish spread of mouthwatering and sumptuous selection of traditional, local and international favorites were rolled out by the chefs, bringing the theme of ‘Juadah Pilihan Tradisi’ this year. The best of traditional Malaysian favorites with a blend of cuisines from around the world with more than 100 dishes ranging from appetizers, soups, main courses and desserts were carefully prepared by the hotel’s Executive Chef, Azamuddin Ahmad and his culinary team. Uniquely this year, there will be a special thematic ‘Daily Must-Try’ corner, which will be featuring all–time-favourite traditional dishes that might be difficult to get nowadays. The menu will be rotated on daily basis on a cycle of 15 days, so it’s pretty much a new dining experience for every visit. Some of the featured dishes include the famous Botok-botok, Pulut Kuning with Rendang Daging, Pulut Serawa, Roti Orak-arik, Ayam Percik Salai, Lamb Kuzi, BBQ feast of seafood and meat, juicy assorted fruity ‘jeruk’, Putu Mayam, Murtabak, Tosai and various kind of pasta from the live action stalls. 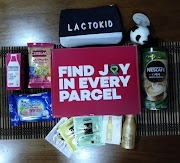 Specially this year, lucky draws will be held every day at Puteri Café so guests got to win attractive prizes such as dining vouchers and hotel merchandises. Other than that, every Friday to Sunday, guests will be entertained by live acoustic performance and Nasyid performance by an in-house Nasyid group, Al-Afsheen. Not forgetting the young ones, clown is also brought to Puteri Café to entertain them. For guests who prefer to break fast with something different, they can find a selection of Dim Sum at Kai Xuan Chinese Restaurant located at Level B1 of The Puteri Pacific Johor Bahru, which offers Ramadan Dim Sum Buffet. Chef Chan Vee Gee has come up with 40 dishes of halal dim sum such as Seafood Soup Dumpling, Three Varieties Egg Rolls, Crispy Egg Tarts, Salad Prawn, Mango Rolls, Prawn Cheong Fun, among others. Ramadan Dim Sum Buffet is available daily during Ramadan from 6.30 pm to 10.00 pm. The Ramadhan Buffet Dim Sum price is RM78+ for adult and RM 55+ for child. 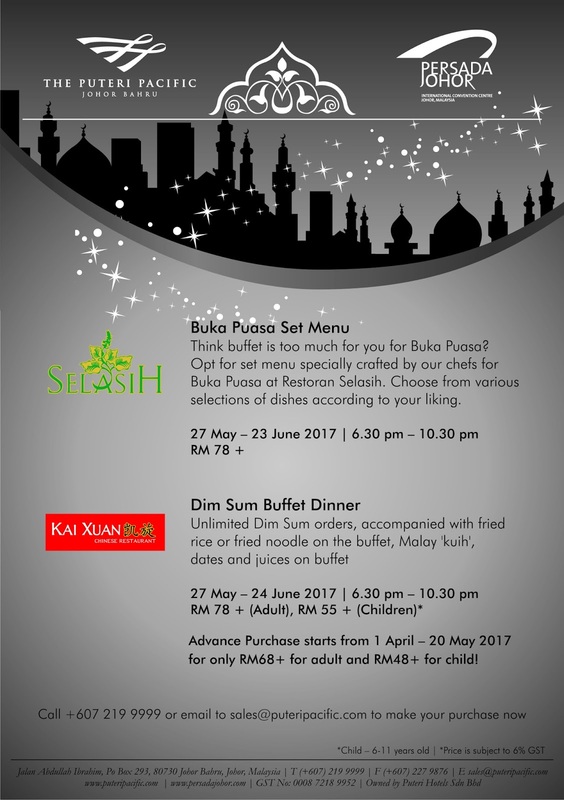 If buffet is too much for some, guests may opt to dine at Restoran Selasih, which will be offering an array of set dishes, specially crafted by Chef Azmie Mat with the price of RM 78+ for a complete meal from appetizers to dessert. “This year, we want to bring a different dining experience to our guests. With carefully handpicked dishes, lucky draws, performances which will entertain not only our adult guests but also the young ones, various room promotions, ‘buka puasa’ and event packages which are tailored especially for Ramadan, we are sure to attract the guests with some more affordable prices, especially if you make an advance purchase” ,said Mr Wan Paris, Executive Assistant Manager of The Puteri Pacific Johor Bahru and Persada Johor. For a limited time till 26 May 2017, Puteri Café will offer an Advance Purchase deal of Buy 4, FREE 1, a saving of up to RM 22+ from the normal price. 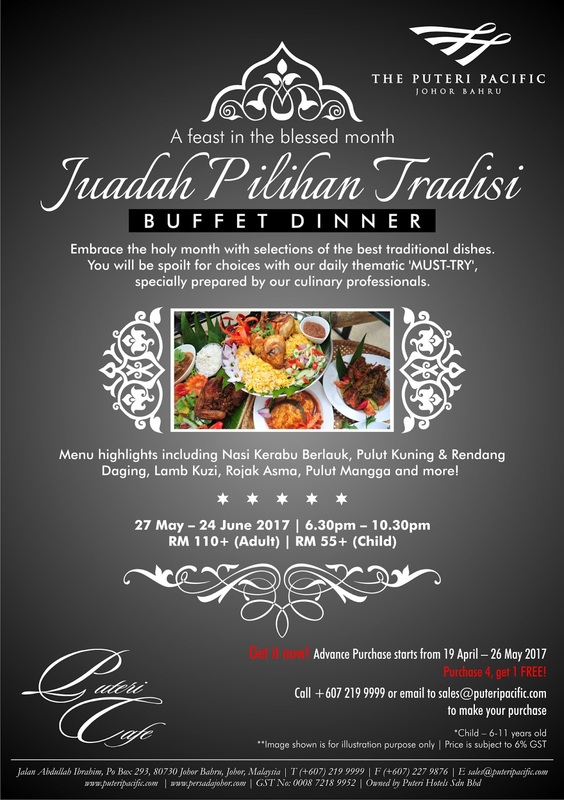 ‘Juadah Pilihan Tradisi’ Buffet Dinner is priced at RM110+ for adult and RM 55+ for child and is open to public from 6.30 pm to 10.00 pm starting from 27 May 2017 until 24 June 2017. The Puteri Pacific Johor Bahru and Persada Johor also welcome individuals or companies who would like to organize private group ‘buka puasa’. 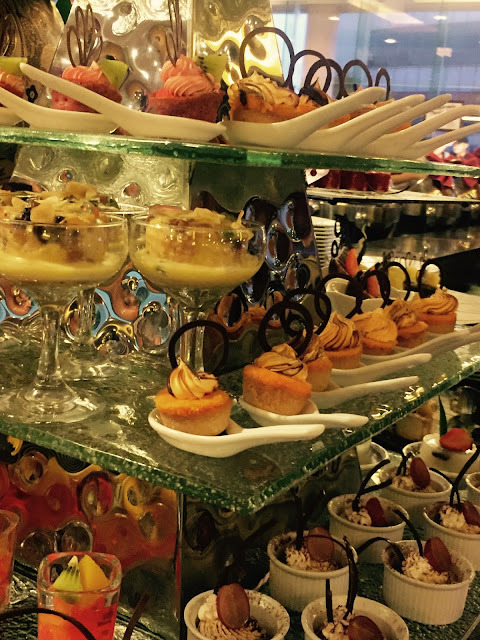 Packages started from only RM 120+ per person for buffet. 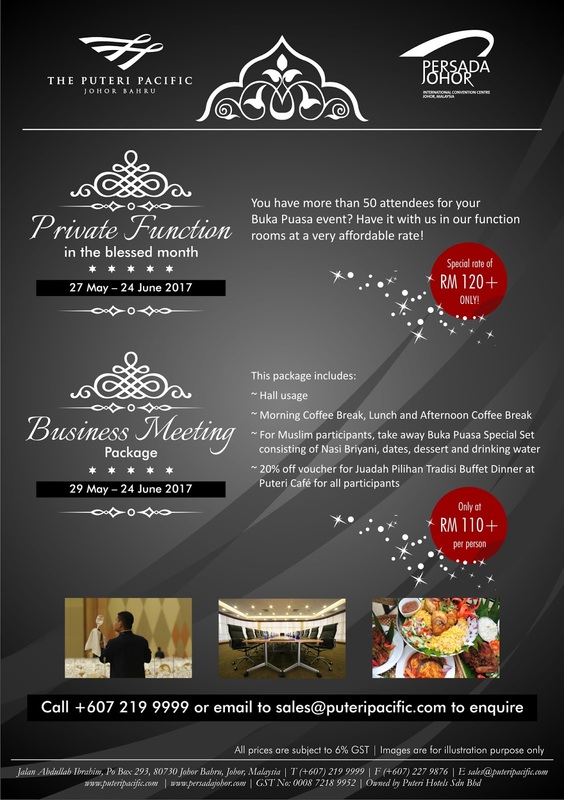 For those who would like to organize their business meetings in the month of Ramadan, packages started from RM110+ with inclusions suitable for Muslim participants. 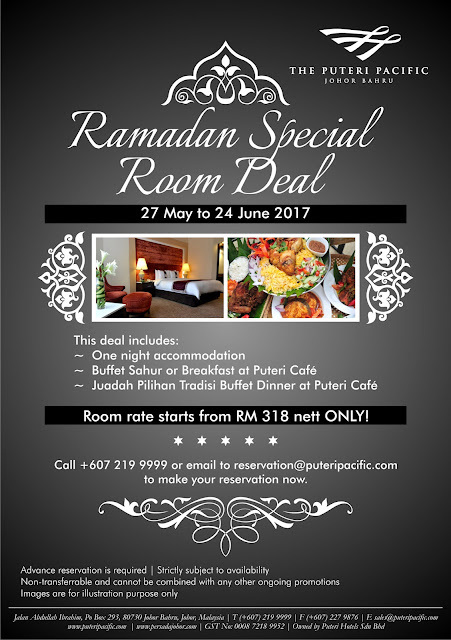 Hotel room rates during this period will start from RM 318+ including with a ‘buka puasa’ experience at Puteri Café. 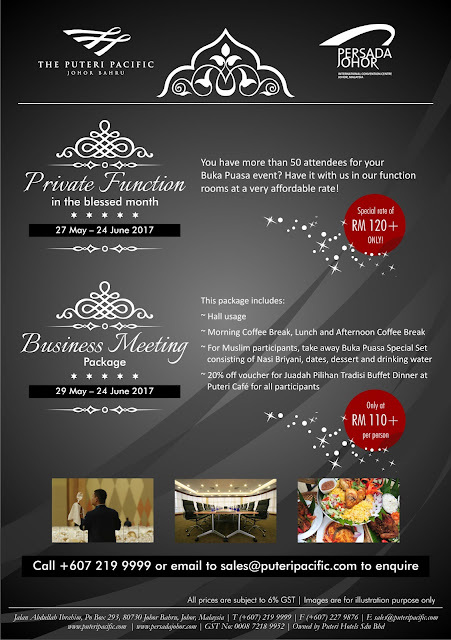 For further enquiries or to make reservations, please contact +607 219 9999 or email to sales@puteripacific.com. The Puteri Pacific Johor Bahru is the city's principal and most central Business and Convention hotel, strategically situated in the Central Business District. 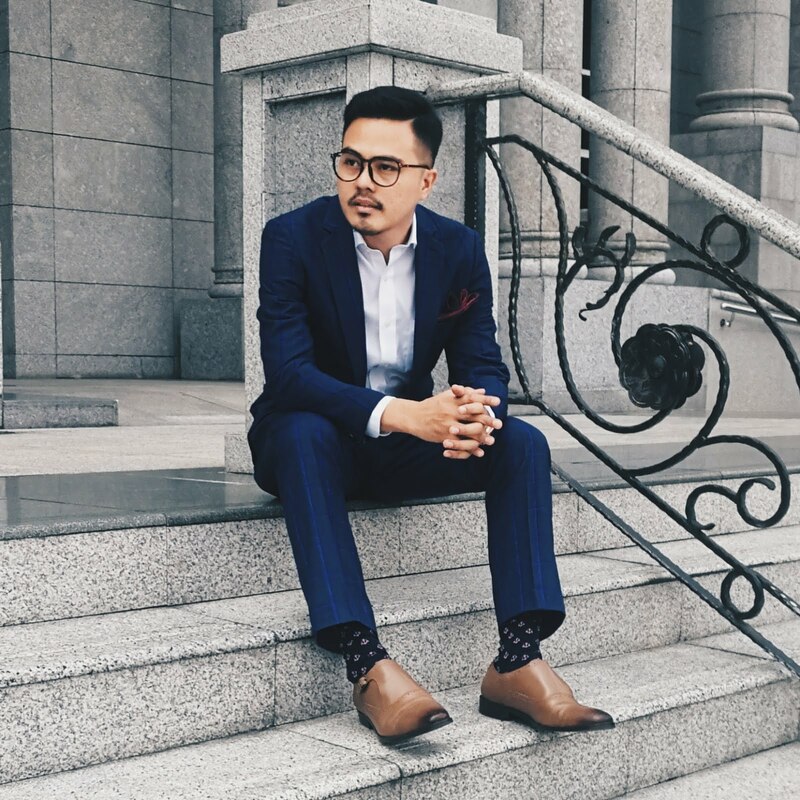 The hotel, which has 416 city or straits-view guestrooms, apartments and suites, also boasts newly renovated Executive Floor Rooms and Deluxe Rooms, and also Pacific Sky Lounge which is located on the 16th floor. 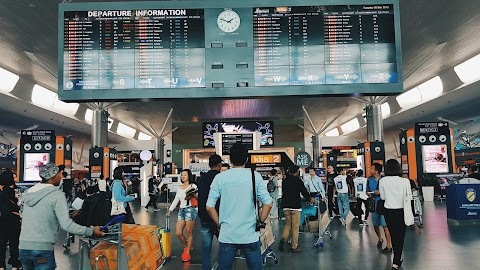 The only convention centre in Johor Bahru, Persada Johor International Convention Centre is just a sky bridge away from the hotel, making it the most convenient place to stay and dine if you are on a business trip.